Everybody knows that physical activity is good for you but we don’t all want to go to the gym or join a sports club and for many of us it isn’t practical anyway. In fact, more than a third of adults and 8 out of 10 children and young people are not active enough to protect their health. That’s why it’s important to make it as easy as possible for people to be more active in their daily lives, for example by leaving the car at home and walking or cycling to local shops, school or work. The way towns, cities and rural areas are set out can help encourage this. On the downside, poorly designed areas can have the opposite effect – and can make it especially difficult for people with limited mobility to get around. new and refurbished footpaths and cycle routes are linked in with existing routes, to help people walk or cycle to school, college and work. Those who are responsible for planning and development in your area should listen to the views and needs of people who walk, cycle, use public transport or drive locally. They should also talk to people with limited mobility and take their needs into account when designing and improving streets, footpaths and other public spaces, to help them move around safely. 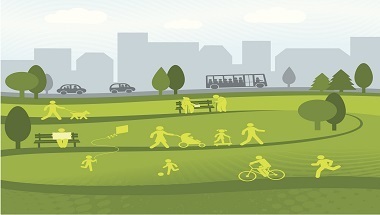 NICE is calling on local councils to encourage people to be more physically active by improving routes for pedestrians, cyclists and other users. NHS Choices has more information about physical activity to stay healthy. We wrote this guideline with people whose mobility is limited by the environment and a range of experts. The latter includes people who specialise in social care, active travel, physical activity, transport planning and landscape architecture. All the decisions are based on the best research available.